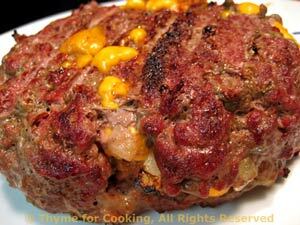 Thyme for Cooking Sunday Supper: Big Stuffed Burger. 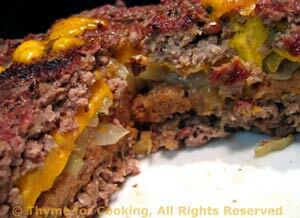 An inside out burger, with the cheese and fried onions in the middle. When the cheese in the middle it hot enough to melt, I consider the burger done. 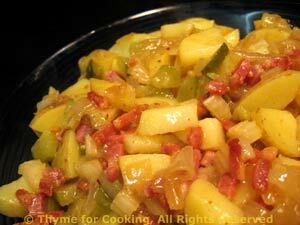 The German Potato Salad will be for 2 meals. Chop onion and sauté in olive oil in nonstick skillet over medium-high heat until tender and starting to brown, about 7 minutes. Spread fried onions on top of bread crumbs mixture and cheese on top of onions. (It gets rather 'high' but it works).